Registration for the first of five regional retreats for Grace Brethren ministry leaders is now open. 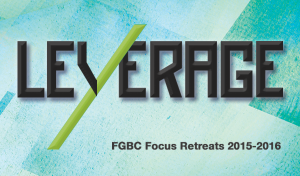 The first retreat, following the theme Leverage, will be held in the Pacific Northwest from September 21-23 at Camp Clear Lake, the facility sponsored by the Northwest District of Grace Brethren Churches near White Pass, Wash., and high in the Cascade Mountains. The retreats provide opportunities for FGBC leaders to refresh, reflect, and retool. Each pastor and ministry leader is encouraged to attend at least one, whether it is in your area or in another region. Other retreats will be: Central, October 05 – 07, 2015; East, October 19 – 21, 2015; Southwest, January 25 – 27, 2016; and South, March 14 – 16, 2016.